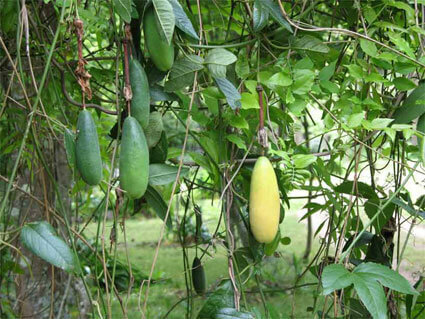 Banana passionfruit is the fruit of several plants in the genus Passiflora and are therefore related to the passion fruit. They look somewhat like a straight, small banana with rounded ends. In its Latin American homeland, it is known as curuba. This variety is a fast growing, evergreen climber. It has beautiful pink flowers in Spring/Summer followed by a fruit in Autumn that tastes like a passion fruit with a hint of banana. This is a frost tolerant passion fruit for all us passionfruit lovers, in cold, frosty climates. Height to 3m. Width to 3m. Frost tolerant and drought hardy.